College students are infamous for being broke and having the worst diets in the world. Running on Caffe Strada coffee and food from the Taco Bell on Durant Avenue, our physical health takes a toll. Something I personally like to do to save money, time and my health (ensuring my daily servings of greens) is to hoard a big pot of pasta salad in my fridge. Continuously eating it throughout the week, I save money on going out, and having it already prepared saves me time. It even helps with healthy bowel movements. Another great thing is that if you don’t want to do dishes, you can just eat it straight from the pot. 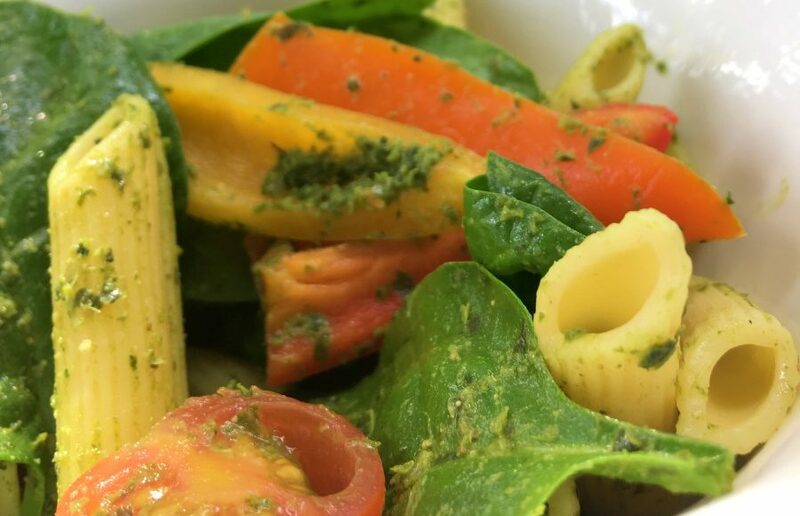 Here’s a simple pesto pasta recipe that will make sure that your poops stay regular and normal! Add pasta to boiling water and let cook until desired firmness. When pasta is done, drain it, rinse it with COLD water and leave it to the side to cool down. While pasta is cooling, rinse spinach, tomatoes and bell peppers. Cut the spinach, tomatoes and bell peppers to the desired size. Add pesto, sliced red bell peppers, spinach, tomatoes, salt, pepper and optional cheese to pot. Stir until all ingredients are evenly distributed. Store leftovers in the fridge and eat throughout the week! Getting ingredients from your local Trader Joe’s or other markets will save you tons of money! I spend roughly $15 to $20 for this recipe that feeds me for a good few days — and comes in especially handy during dead week and finals. The best part of this recipe is that you can add, replace or get rid of ingredients. It’s very versatile, and you can totally make it your own. Essentially, you want to create a pasta salad that tastes good and caters to all your daily servings of greens! Happy pooping and studying! Joyce Cam is the blog editor. Contact Joyce Cam at [email protected].